The Mauna Loa milestone was a grim one. On May 9, the National Oceanic and Atmospheric Administration's Mauna Loa Observatory measured the daily mean of carbon dioxide in the atmosphere at 400ppm, a new record. It was later revised downward to 399.89ppm, but there's little comfort in that. Most days, it records levels over 400, they just don't average to it. Yet. According to the NOAA, "Before the Industrial Revolution in the 19th century, global average CO2 was about 280 ppm. During the last 800,000 years, CO2 fluctuated between about 180 ppm during ice ages and 280 ppm during interglacial warm periods. Today's rate of increase is more than 100 times faster than the increase that occurred when the last ice age ended." Americans are feeling the effects. Last month, a study by the Yale Project on Climate Change Communication issued a report on Extreme Weather and Climate Change in the American Mind that finds 58% of Americans believe global warming is affecting weather in the U.S. and 85% say they have experienced extreme weather in the past year. On the same day that the Mauna Loa Observatory charted near-record CO2, a bit of good news on the transportation front. Motor vehicles account for 15% of global fossil fuel CO2 emissions each year, so the latest automobile results from Consumer Reports are encouraging. "The Tesla Model S outscores every other car in our test Ratings. It does so even though it's an electric car. In fact, it does so because it is electric." For those more two-wheel-minded, proof that bike lanes boost business… The 5th annual, 40-mile Brooklyn Waterfront Epic Ride happens July 27, from Greenpoint to Rockaway Beach… Stockholm's BIKEID beauties will soon be sold here. They're exhibiting them at the international event Wanted Design, May 18-20, at the Tunnel, 269 11th Ave. [27th/28th]. Tickets are $15… Citi Bike Share launches May 27. 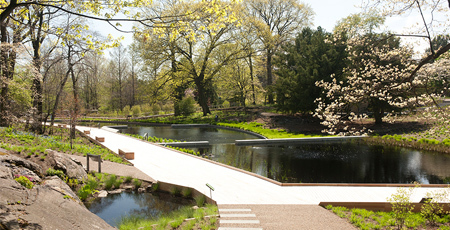 At the New York Botanical Garden, a brand-new Native Plant Garden, 3.5 acres brimming with thousands of plants of the Northeast. A whole lot of gorgeous.